Portable / in-field filtering systems are something I know a little bit about through some marketing work I did a while back for a WaterAid and World Walks for Water global campaign. This was about raising awareness of the issues of contaminated water sources and the need for access to clean water for so many around the world. LifeStraw has a range of water filters that enable people to drink water from most natural water sources and tap water in questionable areas, without the risk of getting ill. The one (understandable) constraint is that the filter is not suitable for salt water. And it ‘s good to see that LifeStraw is running a program called Follow the Liters: for every LifeStraw product sold, a child in Africa receives clean drinking water for a year. As mentioned, I took the LifeStraw Go bottle along with me on my recent Harris and Lewis trip .. no shortage of burns /streams / brooks on those there hills! 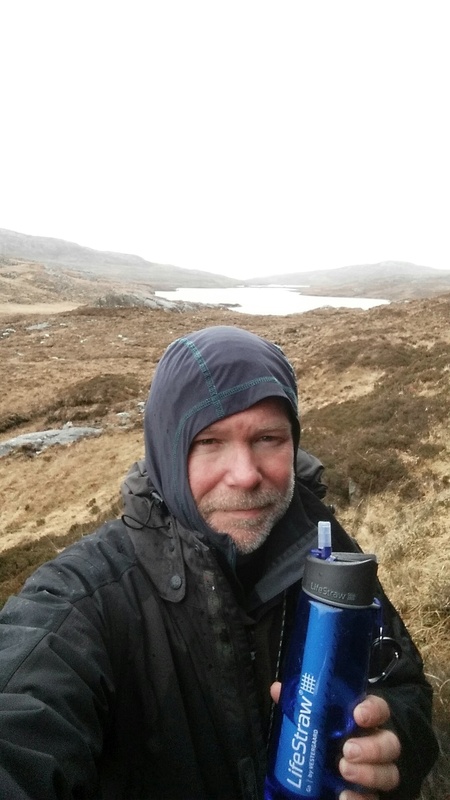 Me with the LifeStraw Go bottle in The Hebrides. And I used just the bottle (no hydro pack etc) on a walk up Suaineabhal (post about that coming soon). There was no chemical taste to my mind (taste buds), just clean water. This is a really clever, useful (vital, even, elsewhere in the world) product.